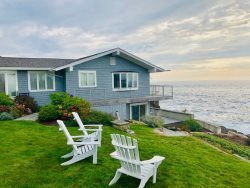 Check in is at 3:00 PM at the Jean Knapp Rentals office at 84 School St., Ogunquit, Maine - located inside the RE/MAX Realty One Office. Several properties have a later check-in of 4:00 P.M. to accommodate the area cleaning services. Please note; these properties are listed on your Jean Knapp Rental Agreement. Check out is at 10:00 A.M. - on the day of your departure return all keys and/ or pass codes, and parking passes to the Jean Knapp Rentals office by 10:00 A.M. or you will be charged a day rate for late return. Unfortunately we do not allow any early check-ins. Our cleaners need the proper amount of time to clean the property before you arrive. Please plan accordingly to not arrive prior to 3:00 P.M. Sorry no exceptions. How long after I check out will I receive my security deposit back? Assuming there was no damage and all check-out procedure were followed, your security deposit will be returned within 3 weeks of your departure. We will send a check by mail. Our web site provides on-line booking for most of our available properties. Select your week of stay, and define the number of guests or number of bedrooms. This will bring up a list of properties available for that week. Each property can be opened to review more photos, details about the property, calendars, and a map. Should you find one that requests you contact our office, give us a call and we will assist you. Office hours Fall and Winter Hours - Monday through Friday 9 A.M. to 5 P.M., and in the late Spring and Summer months - Tuesday through Saturday 9 A.M. 207-646-4548. We have only a few properties that are pet negotiable. Please use the advanced search bar and select "Pets Allowed" in order to see these properties, or give the office a call at 207-646-4548.